These lil truffles got me in trouble. I decided to bring them to my family’s 100th family reunion in rural, conservative Indiana. I doubled the alcohol content to spice things up (oops). Blue-haired ladies shot me condemning glances, children were shooed away from the platter of chocolates, but my zany Aunt Judy gave me the thumbs up sign! 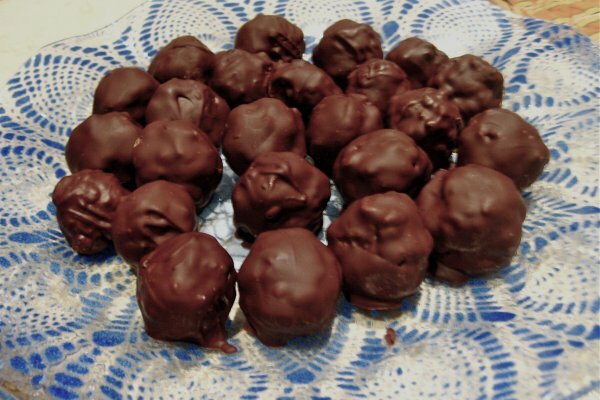 Pecan pie truffles are a crowd-pleaser, provided that no party guest adheres to strict sobriety! It’s a simple recipe that is intensely decadent. The balls combine the best parts of pecan pie and make a great addition to any holiday spread. Bourbon works to give these treats a nice kick, but try to get your hands on Grand Marnier or Cointreau for some zest! Suzannah Schneider is a student at Tulane University and has just returned home for winter break. So far, she has done nothing but cook and eat and is unashamedly content with the use of her downtime. In a medium bowl, combine pecans, graham cracker crumbs, brown sugar, and salt. Add maple syrup, alcohol, and vanilla. You may want to use your hands to ensure that the mixture has been completely mixed. Form the mixture into walnut-sized balls, then place on a cookie sheet and freeze for 2 hours. In the top of a double boiler or in a medium stainless steel bowl set over a pot of gently simmering water, melt chocolate. Line a baking sheet with parchment paper. Dip the frozen balls into the melted chocolate with a fork, then place onto the prepared baking sheet. Let sit for about 15 minutes, or until firm. Categories: Campus Cooking, Dinner Parties, and Recipes. I'm Cooking For...: Christmas, Dates, Dinner Party, Fall, Valentine's Day, and Winter. I Don't Eat: Any Animal Products, Dairy, and Meat.